We arrived at Maputo airport on Sunday morning 21st September where missionary, Melvin Kelly, was waiting for us. First impressions were like that of any other city until we started to encounter the bumpy roads on our way to the OMS compound at Machava which was to be our home for the duration of our stay. Sharon and Melvin invited us for lunch and it was nice to spend some time playing with their kids and getting to know them all as a family. As we had been travelling for 24 hours we went back to our house to have the batteries charged before orientation in the evening! Margaret and I initially joined the team to assist with the Nkateko project by teaching the pastors wives to crochet, and our first session was Monday Morning at the compound. This was a very special time for us as we were greeted with hugs and kisses from all these lovely ladies and two of the leaders from the National Church also came to welcome us to Mozambique and prayed for us. The women were eager to learn this new craft and quite a few had mastered it before hometime. During our stay we were able to meet up with these ladies again and it was so encouraging to see their enthusiasm and eagerness as they each brought along different samples which they had made at home. We also visited several women who were housebound and taught them to crochet. This took place on a rush mat under a tree or on the doorstep which proved to be an attraction in the community as the local women, children and sometimes men, gathered round to observe what we were doing. All of the team were involved in home visits, which we all found to be very humbling as people very readily invited us into their homes. They talked openly about the difficulties they faced e.g. wheelchair tyres always getting punctures or perhaps in need of maintenance, mobility issues etc. and this is when Helping Hands can offer to carry out any necessary repairs and also provide knee pads. Someone from the group would then read a passage from the Bible and share a few thoughts, while another would commit the family and their needs to the Lord in prayer before leaving. During our time in Mozambique we touched over 50 people with disability and the Helping Hands team will continue to keep in contact with them. We hosted Health seminars in two different locations which were very well attended. Michelle gave two very informative talks on Nutrition and Diahorrea and it was good to see audience participation. Dr Mario Gomez also spoke on Anaemia, Blood Pressure and Diabetes. Afterwards, everyone availed of the opportunity to have their blood pressure checked by Dr Gomez and ask questions regarding any health issues they had. We also had the opportunity to visit the Arco Irish Orphanage and were invited to have our lunch in the dining hall with the children, who were not shy about coming to sit with us at the table. It was nice to see that these kids were being well fed and cared for and we were very impressed with their manners. Our main focus was on the special needs unit where we played, nursed, sang, kicked football etc. with the kids. Mama Sonia, who is in charge of the unit, is very passionate about her work and her vision would be that the children could stay there 24/7. 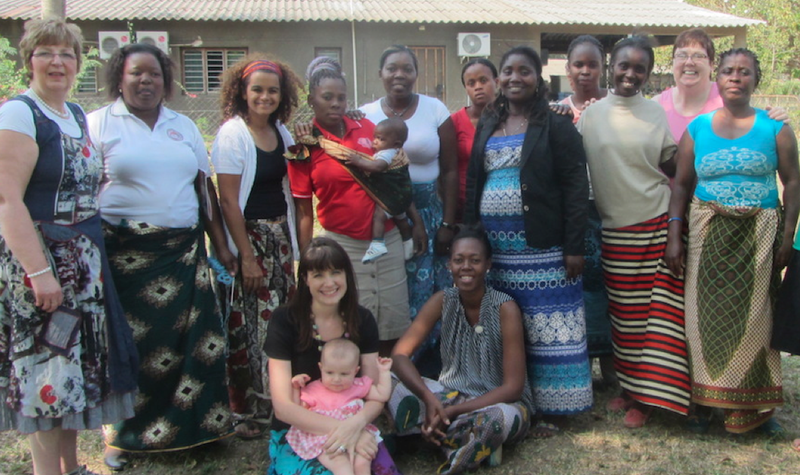 Our time in Mozambique flew by as we had a full schedule each day, and it was especially hard to say our goodbyes. Each of us left feeling very challenged, humbled and blessed and trust that we have been a blessing to those we came in contact with during our stay. Team members – Margaret McClure, Anne Caulfield, Audrey Knox, Michelle Heffer.